This easy to prepare family favorite is a central part of weeknight meal planning. Add dinner rolls and a tossed salad for a complete meal. Prepare grill for direct cooking, preheat to medium temperature range. Grill sausage links over direct heat, turning every minute until sausage reaches an internal temperature of 165°F. Remove from grill. Cool slightly. Cut sausage into ¼" circles. Meanwhile, using medium-high heat, heat oil in a large, heavy skillet. Add onions and sauté for about 2 minutes, stirring occasionally. Add garlic and cook, just until fragrant, about 30 seconds. Reduce heat to low and add tomatoes, sausage, and vodka sauce. Simmer on low for 5 - 8 minutes. Cook linguine in boiling salted water, according to package directions. Cook until al dente. Drain. Portion cooked linguine onto warm plates or pasta bowls. 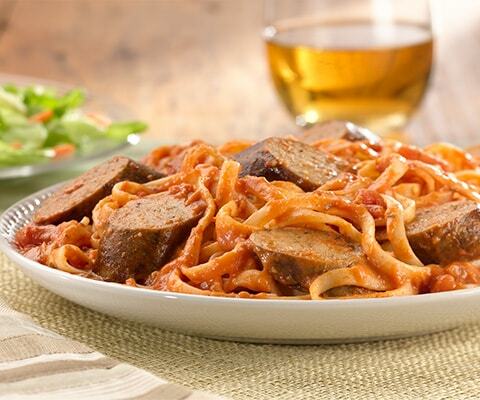 Spoon sausage/sauce over pasta. Sprinkle each with Parmesan and garnish with sprigs of fresh oregano. Simon says you'll like this. I've been doing a version of this ever since I had some pasta with vodka sauce at a restaurant and found Classico offered the sauce in their lineup of products. I add some marinated artichoke hearts and sometimes a small jar of roasted red peppers. It is fun to experiment around with different kinds of sausage as there is quite a variety these days. This recipe is a no brainer which can be done in minutes and will please everyone. Real comfort food.